Articulate Education UK: Movie poster - The Arrival! Ok, I know we are only half way through filming but I couldn’t resist making a quick poster for the movie! A lot of the work I do involves children filming or publishing their work. I think a fundamental part of developing children as authors or artists with a genuine sense of voice is that they get to see their work promoted, shared and celebrated. If you’re making a film for a real audience, then it needs to be promoted as a real movie. I wonder how much of a perception shift the impact of this has? When you explain to a group of children that you are going to publish a book or make a film, one of the greatest challenges is convincing the children that you mean it – that their work really will get shared even if it is just locally in the school. This, I suppose, offers an insight into how they view their education. From past experiences, getting children to see themselves as authors requires an injection of confidence and when they see their work being shared publicly, I think this is when they start to feel more confident about their capabilities. 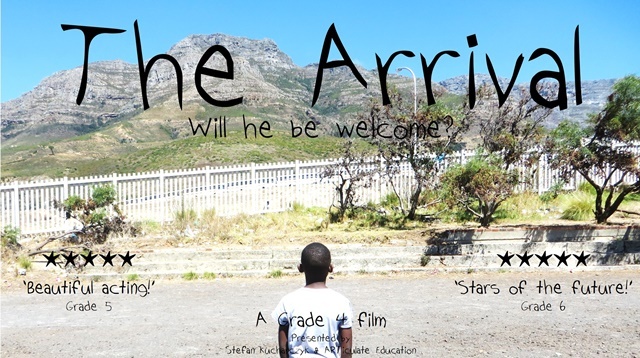 So here is the poster for the movie ‘The Arrival’ featuring the wonderful children of Grade 4, filmed on location in Cape Town.